China National Day celebration (10 October) aka double ten usually will see an exodus of expatriates balik kampung. I always look forward to double ten as i will get to catch up with my buddy Soon Fatt, who is based in China, when he performed his annual “balik kampung” ritual. 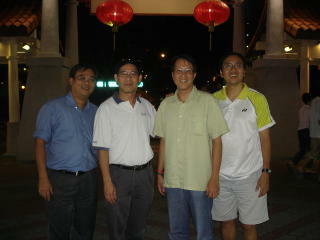 This time round, we manage to round off a few other buddies for a Chilli Crab feast. 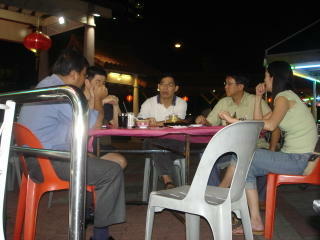 Venue: Bukit Batok East Ave 4. dinner was at 730 pm. the empty chair was for eddy who was could only make it at 8. 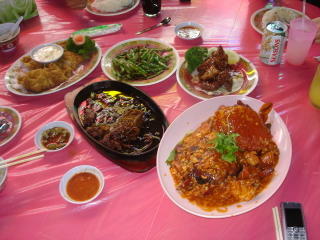 Chilli Crab, Venison Meat, Foo Chook Roll, 4 season beans, pai guak wong (rib)…. yummy yummy. On top of this we polished off two plates of noodle – yee meen & sang meen. ah piew who had to go off early & offered to pay for the meal. we were thankful. he put $20 on the table. the meal cost $95. piew… u owed us $75. will collect when we meet again hehehe!! Smiles! Dinner over! SF would be off the next day to “tour” Malaysia for a week.